This Honey Mustard Chicken tasted amazing! I usually don’t like white meat but this was so moist and the flavor….wow! I would eat this again anytime. I had a gigantic chicken breast and cut it up for my husband and myself. If you make this for more than two people just double it, triple it or what ever amount you need. I used my homemade Honey Mustard Sauce (https://indianeskitchen.com/2018/02/07/honey-mustard-sauce) with this, however, you can use any Honey Mustard Sauce you would like. Click on the link below to view the step by step directions with pictures and a printable recipe card. It’s DEFINITELY soup season. We were in Paris over the weekend and I had some French onion soup while we were there and wanted to make some soup for lunches this week when we got back. I was going to stick to my usual tomato and basil as it’s my favourite, but thought I should spread my wings a little! Plus, Tesco’s didn’t have any fresh basil when I went so I improvised! I thought I would go for butternut squash as there’s something about the vibrancy that brings warmth to the dish before you’ve even eaten it. I always make soup on the hob so I thought I would roast the veg for this one then add the stock and blitz it up after. Anyone can make soup and it’s a great way to get your daily veg intake without even realising! Prep time – 15 minutes. Cooking time – 1 hour 15 minutes. 1 large butternut squash – remove seeds and skin, cut into large chunks. 2 large brown onions sliced. 4 garlic cloves left whole. Handful of fresh sage leaves. A few thyme sprigs – just remove before blitzing. Read full recipe here: Roasted butternut squash and honey soup. — A food and lifestyle blog. Winter really is the only break for beekeepers. Even then, there is preparation for the coming spring. But now and then the beekeeper gets a chance to sit down and read a little. The books described below are readily available at many public libraries. Hopefully you can find one to hunker down with during cold days while the bees are snug in their hives. The Beekeeper’s Lament: How One Man and Half a Billion Honey Bees Help Feed America by Hannah Nordhaus (638.13097 NORDHAUS) – Recounts the experiences of John Miller, one of the foremost migratory beekeepers, who, despite mysterious epidemics that threaten American honey populations–and the nation’s agribusiness–forges on and moves ahead in a new natural world. Robbing the Bees: A Biography of Honey, the Sweet Liquid Gold That Seduced the World by Holley Bishop (638.16 BISHOP) – A comprehensive exploration of the life of bees and the process by which they make honey follows the daily life of a Florida panhandle beekeeper, traces each step of a bee’s honey-making process and offers insight into the product’s key role in business, food and culture. Letters From the Hive: An Intimate History of Bees, Honey, and Humankind by Stephen Buchmann with Banning Repplier (638.1 BUCHMANN) – A glimpse inside the world of the honeybee records the traditional practices of beekeeping around the world, the contribution of bees to the pollination of plants and the culinary and medicinal uses of honey. Fruitless Fall: The Collapse of the Honey Bee and the Coming Agricultural Crisis by Rowan Jacobsen (638.15 JACOBSEN) – Traces the significant 2007 and 2008 reductions in honeybee populations, identifying the causes of Colony Collapse Disorder to explain the link between bee pollination and industrial agriculture and predict dangerous reductions in food output. A Book of Bees…and How to Keep Them by Sue Hubbell (638.1 HUBBELL) – Chronicles a year in the lives of beekeeper and bees, describing and explaining the activities of both and the rewards of having bees of one’s own. Honeybee Democracy by Thomas D. Seeley (595.79915 SEELEY) – Honeybees make decisions collectively—and democratically. Every year, faced with the life-or-death problem of choosing and traveling to a new home, honeybees stake everything on a process that includes collective fact-finding, vigorous debate and consensus building. These incredible insects have much to teach us when it comes to collective wisdom and effective decision making. Sweetness & Light: The Mysterious History of the Honeybee by Hattie Ellis (595.799 ELLIS) – Integrating popular science and social history, an intriguing global history of honeybees examines the hive society of the bee, as well as the influence of bees and honey on diverse cultures around the world and throughout history. The story of bees and honey from the Stone Age to the contemporary cutting edge; from Napalese honey hunters to urban hives on the rooftops of New York City. This time of year can be as busy for the beekeeper as the spring nectar flow period. But now it’s all about preparation. My experience, since beginning this beekeeping journey, is that there is never enough time during the nectar flow. In fact, time becomes precious even before the nectar flow with the need to rotate hive bodies or employ other swarm reducing measures, placement of swarm traps, movement of hives to out yards, making splits, and lots of last minute surprises. Order queen pen and my favorite markers to write on the hives. Making sugar cakes for the tops of the hives. Adding extra wax to plastic frames. Collecting and bagging pine straw for my smoker. Building boxes, bottom boards, and tops. Adding some color to the entrance reducers. This is Advantech – a new material that resists weathering. Joy! I found three 50 pound sacks of sugar I had forgotten! In 1920 the American Bee Journal published a book called “Beekeeping In The South; A Handbook on Seasons, Methods and Honey Flora of the Fifteen Southern States”. Written by Kennith Hawkins, a Beekeeping Specialist and “Former Special Agent in Bee Culture”, this book paints a nostalgic picture of what it took to keep honey bees in the south a century ago. While major players of today’s industry like the infamous Varroa mite are missing from this text, it is surprising to see just how well the author’s advice holds up in today’s beekeeping industry. Below is an excerpt from this book, a chapter entitled “What a Beginner Must Learn”, shared here with permission from the American Bee Journal. I have never made French Toast with Honey Custard before and it was delicious! This recipe will feed 6 people or you could freeze any leftovers. I could eat this Honey Custard French Toast for any meal, not just breakfast. Picture from Coweta Sustainable Beekeeping article. I have raised 5 frame nucleus hives since 2016 from Spring splits and allowed them to grow out to double boxes (ten frames). Last year, and this coming, I’ll graft queens and be using the Coweta mindset and method (below) to make increase or to sustainably maintain a hive after the sale of a nucleus hive or queen. I always retain 5 frames with at least one frame of young larvae and notch the cells to raise a new queen as detailed in the following article. Most beekeepers are not sustainable; they purchase nucs or packages each spring to replace winter losses. This is expensive and prevents the creation of local, sustainable honey bee genetics. The true cost of a package or nuc can escalate when some die during the winter before producing any honey. If only half of these young colonies survive until next spring the cost per a nuc or package doubles. A beekeeper with only a few hives may experience the disheartening loss of all their colonies. No honey will be harvested for a year and they must start over purchasing nucs or packages if they can find them. If you have bees you can make more bees or more accurately, colonies can be used to make more colonies. All beekeepers have the resources in their colonies to become sustainable. In the south, winter losses average one-third. During the summer make enough splits to begin winter with one and a half times the number of colonies required for honey production in the spring. If six colonies are required for spring honey production, begin winter with ten. For example, begin the winter with six production hives and four nucs. After losing two production hives and two nucs during the winter, a 40 percent loss, the two remaining nucs are used to replace the dead colonies restoring production hives to six. There is no need to buy colonies because of winter losses. In May, splits can be started to replace the nucs bringing the total number of colonies up to ten again. In large sauté pan, bring green beans and ½ c. water to boil. Lower heat and simmer until beans are tender-crisp. Drain. To sauté pan, add butter, pecans and drained green beans; cook over medium heat for a few minutes more, adding honey and seasoning and cook until green beans are tender. Serve hot. 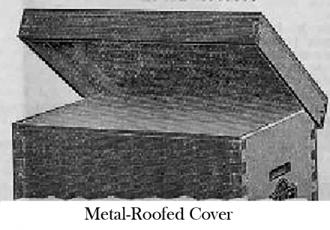 I have found it interesting to look at the types of different beehive covers or tops that have been used over the years. I began my search with the first beehive that was patented in the United States but had a problem because the patent office burned in 1836 and many of the early written patents were destroyed. My records show that there were 1,131 beehives patented up to 2009. Some of these hives were the same hive with improvements to keep the patent in effect. The very first beehive patented was developed by J. Sweet, April 11, 1810, in Bethlehem, MA, but that record was destroyed in the fire. I found patent X 5,872 was granted to Ebenezer Beard in 1830 and most of the written part was recovered from the fire and had a flat attached cover. Sixty eight patented beehives later, in 1853, Lorenzo L. Langstroth was granted a patent for a hive. Reverend Langstroth had actually developed five different models of beehives and most of his hives had flat tops. However his fifth hive was a glass hive within a hive and the outer top could be tipped forward. So it might be classified as a telescoping cover because it covered an inside hive. During the 23 years in between the Ebenezer Beard hive and the Lorenzo L. Langstroth hive there were 44 flat topped hives that had covers that were hinged, attached or simply rested on the beehive. 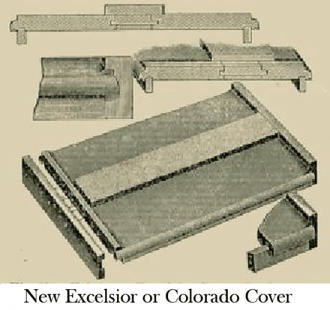 There were four beehives that had covers sloping in one direction and two telescoping covers. Eleven hives had unusual shaped covers with projections and seven hives had pitched or gable tops. When you stop and think about it, it isn’t really that unusual, as the trend in the early times was to convert a piece of furniture into a beehive and have drawers or a side panel that could be opened. The lumber in the 1850s was available in wider widths so you could get a single piece that would cover the entire hive. However you would encounter the problem of warping or cupping, allowing the top to have gaps between the bottom side of the cover and the super below. The gaps could be viewed as being good or bad. The gap would provide upper ventilation and an upper entrance to the hive. However, if you wanted to move the hive there was just another place for the bees to escape from the hive. Thus to eliminate the warping, the boards could be cut in narrower strips, the grain reversed and cross pieces used to hold the boards together. This style of cover is very much like the today’s migratory cover. A problem arose, what do you do with a flat top once it is removed? You can’t just lay it on the ground in the same orientation as it would smash bees. Your best choice would be to prop it up against something else. Once a bee is smashed, the alarm pheromone is released and the other bees are now on alert. If you reverse the top and lay it on the ground, you can’t use it to stack equipment on it because it may violate bee space and squash bees. That is why Baklava has many varieties, the traditional baklava is made with walnuts and in the southern with pecan and in the western with almonds. The Turks are known to famously make it with pistachios. I prefer pistachios and almonds in my Baklava.Today I’m sharing with you all, the easiest and yummiest homemade baklava recipe. The basic ingredients for baklava are nuts, phyllo pastry and syrup or honey. I bought the phyllo pastry from the supermarket. You can find it in the frozen foods aisle. I’ve used a mixture of almonds and pistachios for nuts and made a beautiful rose flavored honey syrup. This is one of those recipes that you cannot fail with and even if you try hard to do, the outcome no matter what is going to be absolutely delicious. Just a refreshing anytime salad that is quick and easy to make. The secret to it is rice vinegar. The cucumbers I used was end of the season large and full of seeds. I seeded them and peeled them. You can slice them the way you want. Add tomatoes cut in wedges and thinly sliced sweet onion. I like to make the dressing and put my sliced onions in first and let them marinate for an hour. Add cucumbers, tomatoes and parsley when ready to serve. Who is that hooded man? The Honeybee and the Maple Tree have an interesting relationship. In the very early spring when the perfect combination of freezing nights and warm days allow, the maple tree runs sap. This process is what allowed the ancient Americans to learn to harvest maple sap to create Maple Syrup and Maple Sugar. All of our North American maples produce a sweet sap in the spring. The Sugar Maple-Acer saccharum is the most famous. Sugar Maple has the highest sugar content and is the most efficient source for sap to make Maple Syrup. Red maples and Silver Maples are the other two large maple species that are most familiar to us and likely to produce sap for the bees. Ask a non-beekeeper what bees collect when they forage and you will probably hear of nectar and pollen. But few will mention propolis. Yet propolis is an essential material bees use to maintain and protect the hive. To be factually accurate, bees don’t collect propolis. Instead, they create it inside the hive from other substances they have foraged. These cupcakes might look plain, but they’re far from that! Cut up bits of walnut give a warm, earthy flavor and together with the cinnamon, nutmeg and cloves it makes a great, wholesomely warm fall/winter dessert. These cupcakes retain a moist texture thanks to these walnuts and lend themselves well to being decorated creatively. Begin by mixing all dry ingredients in a large bowl. Add the butter, when the butter is well mixed in, add the eggs and honey. Scoop them in muffin forms and bake at 180°C for 20 minutes. Mine are way too big for this recipe as you can see in the pictures, I used old-fashioned sized ones that weren’t suited to the muffin tin. Decorate as you wish. I mixed almond essence with honey and almonds. You can also decorate with whole walnuts. You may have heard that Arthur Conan Doyle’s famous consulting detective, Sherlock Holmes became a beekeeper when he retired. But how do we know he took up beekeeping, and why did Sherlock become a beekeeper? Below, you’ll find a quote from the book, and possible reasons why Sherlock Holmes decided to take up beekeeping as a hobby. Sept. 30, 1852, was a fine clear day, and Henry David Thoreau decided to go bee hunting. He ended up feeling richer for the experience, and not just because of the honey. He was 35 years old, living in Concord, Mass., as the town’s principled eccentric. Two years earlier he had published A Week on the Concord and Merrimack Rivers, but it wasn’t a success. He had finished his sojourn in the woods, though he had yet to publish his masterpiece, Walden. He had already spent a night in jail for refusing to pay his poll tax as a protest against slavery and the Mexican War. He was hiding escaped slaves in his family’s home and taking long walks in the surrounding woods and fields. He recorded in great detail his observations of nature in his journal. On the day he went bee hunting, he described how he went with three friends in a wagon to Fair Haven Pond. They brought with them their bee-hunting apparatus: a small round tin box and a small wooden box. People love to ask questions when they find out that we started keeping bees. One of the most common questions is, “When will you start selling honey?” That question is usually followed by the comment, “Local honey is really expensive. You can make a lot of money.” In our part of the Midwest, local honey sells for anywhere between $8 and $12 for a 1 pound bottle, and those prices are typically set by hobby beekeepers who sell mostly at places like farmers markets. If you read my previous blog post, you will know that hobby beekeepers aren’t getting rich on their honey. The question that people should be asking is, “Why is the grocery store honey so cheap?” The answer to that question will probably shock you. Wait until you taste these all natural Pan Fried Honey Bananas! They are unbelievably easy to make and are sweetened naturally with honey then sprinkled with cinnamon. You could eat this for breakfast but for me it is more of a dessert or great snack. Walter “Walt” Whitman, May 31, 1819 – March 26, 1892) was an American poet, essayist, and journalist. A humanist, he was a part of the transition between transcendentalism and realism, incorporating both views in his works. Whitman is among the most influential poets in the American canon, often called the father of free verse. His work was very controversial in its time, particularly his poetry collection Leaves of Grass, which was described as obscene for its overt sexuality. This is the video number one of a series of videos about the honey bee diagnostic laboratory at USDA Beltsville Maryland. This video series will cover the main diagnostic procedures applied to bees sent to the lab for diagnosis. In this video, Dr. Humberto Boncristiani and Sam Abban discuss the best procedure to send samples of Adult honey bees to the lab. It is very important to send the sample the right way to improve the quality of the service. If you want to know more about this service provided by the laboratory check the link below. One of our favorite things about fall is; FOOTBALL!!! There is nothing more thrilling then hanging out and watching the game with friends and family! One of our favorite dips to eat when we are watching the game is Honey Jalapeno dip. This is perfect to serve with crackers, chips, and vegetable trays. We even like spreading on our sub sandwiches. Hope you enjoy it this dip as much as we do!